You might do a double take when you see this particular robot - and if you did you would not be alone. 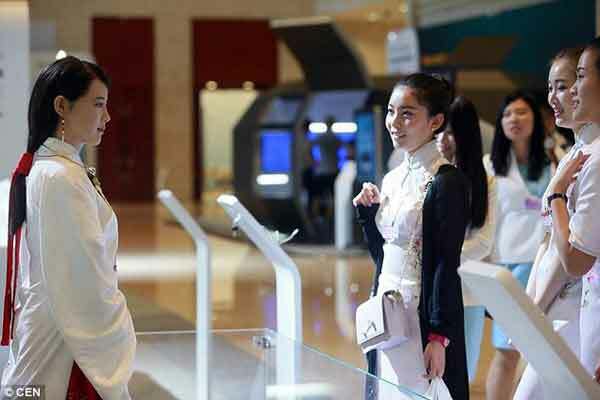 Visitors to a recent exhibition in China were greeted by Jia Jia, a humanoid robot who is not only scarily lifelike, but intelligent and quick-witted too. 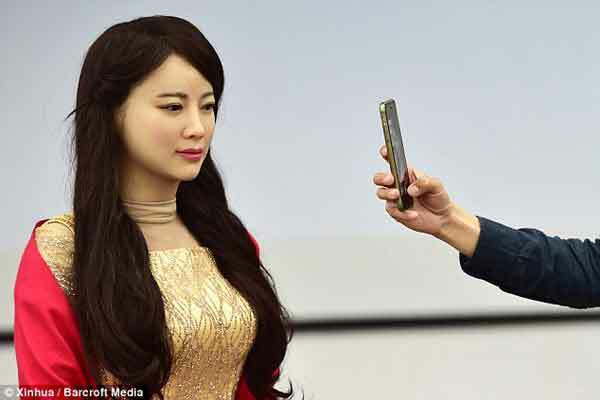 The female robot has been called a 'robot goddess' by her hoards of online fans, and some who met her at a recent exhibition were taken aback by her lifelike appearance. Jia Jia stood near the entrance of the exhibition hall that hosted this year's 2016 Summer Davos Forum in Tianjin, in a major port city in North China. 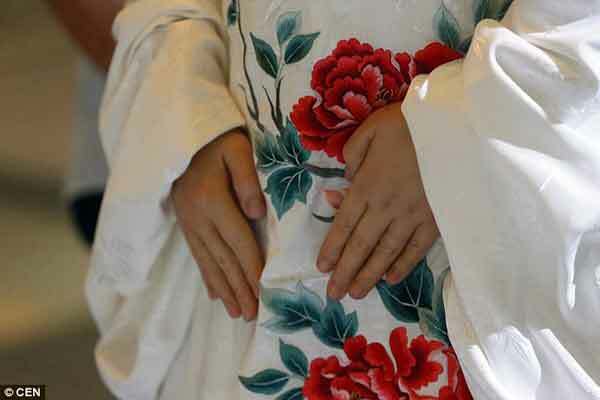 She was dressed in a traditional Chinese outfit, hairstyle, complete with a classic hairpin, and immediately caught the attention of passers-by. This life-like cyborg is the brain child of Chen Xiaoping and his colleagues at the University of Science and Technology of China, who unveiled the technology today in Hefei, capital of east China's Anhui Province. Her 'brain', which is essentially a huge online database, is connected to a cloud computing platform that allows her to enhance her ability to process emotions and speech as new data is uploaded. Jia Jia can hold conversations with those who ask her questions and respond in less than a second. Reports said she is also able to make micro-expressions and recognise the facial expressions of others. 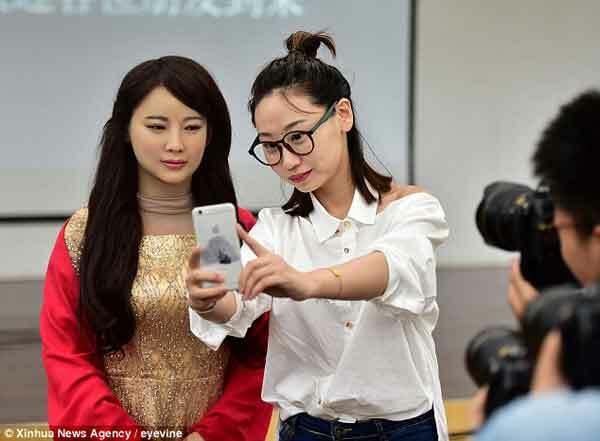 She is thought to be one of a kind in China, although in the past few years there have been other similar 'smart' bots made by engineers. According to reports, the Chinese are taking a great interest in robotic technologies, with China accounting for more than 25 per cent of global industrial robot sales in 2015 - 62,000 of 248,000 units sold worldwide last year. The Summer Davos Forum was established in 2007 and alternates between the cities of Tianjin and Dalian - in north-eastern China's Liaoning Province. The robot was first unveiled earlier this year. Hello everyone, I'm Jia Jia. Welcome!' the robot said as it greeted the audience at the university's multi-media center in May, reported Xinhuanet. 'Don't come too close to me when you are taking a picture. 'It will make my face look fat,' Jia Jia said. This group of researchers were also the masterminds behind the service robot 'Kejia' that took home first place at the RoboCup championship in 2014. Kejia reached a historical mark 8,555 points by showing off its skills of neatly lining up drinks. But Xiaoping's robot goddess doesn't seem like it will be used in any competitions. 'We hope to develop the robot so it has deep learning abilities. We will add facial expression recognition and make it interact more deeply with people,' Xiaoping explained. He also revealed that Jia Jia was 'priceless' and the team would not consider mass production, yet. Hello everyone, I'm Jia Jia. Welcome!' the robot said as it greeted the audience at the university's multi-media center today, reports Xinhuanet. 'Don't come too close to me when you are taking a picture. It will make my face look fat,' Jia Jia said.